The School has a fully equipped 8- bed Infirmary with the provision of an independent isolation ward. The team of medical personnel include a resident full time Lady Doctor and experienced and caring day and night nurses. In addition, the School has a tie-up with the nearby super specialty Jaypee Hospital Noida & Max Hospital Noida, for any medical emergencies. All scholars undergo a full medical examination at the beginning and end of every term. Medical records are maintained and an end of term medical report is handed over to all parents. Additionally the Resident scholars are taken for full body check-ups twice a year and are also taken to nearby empanelled clinics for eye and dental care. 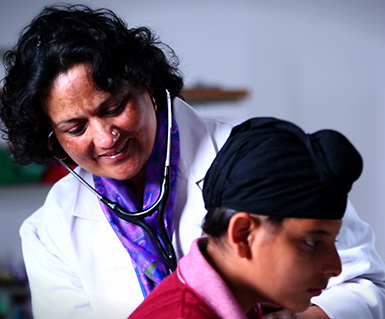 The Infirmary uses an ERP system to track and monitor the scholar’s health on a daily basis. If needed, a sick report is circulated in the morning to the concerned staff, including the Sports department.